Eggplant antipasto: Ciao!! 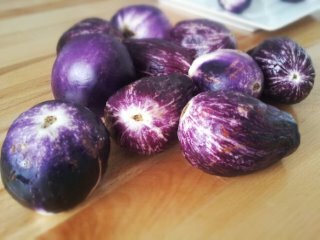 As promised to all you folks visiting The Farm, here is the recipe for that wonderful and very popular Eggplant Antipasto. 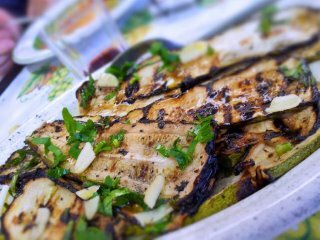 We cooked our eggplant antipasto using a George Forman which took a bit of time, but you can prepare your eggplant on the BBQ or even in the oven. First warm a grill to medium to high heat. I have a very handy pan that sits on stove. 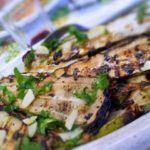 Place the slices of eggplant on the grill and cook for up to 3 minutes each side or until you can see the dark bands created by the heat of the grill. You may need to work in batches. In a shallow dish arrange the first batch in one even layer. Sprinkle with a pinch of salt, parsley, garlic and lemon juice. Continue in this way until you have cooked all of the eggplant, finishing with the salt, parsley, garlic and lemon juice layer. Pour the oil over the eggplant 2/3rds of the way then gently press the slices of eggplant down into the oil. Pour more oil over the top, enough to cover the eggplant. Cover the dish with clingfilm and place in the fridge for up to 1 – 4 hours before serving.